Nicole Kidman has transformed for her new role on The Undoing. Source: Getty. She is very rarely seen on outings with her children, preferring to keep her private life separate from her high profile acting career. 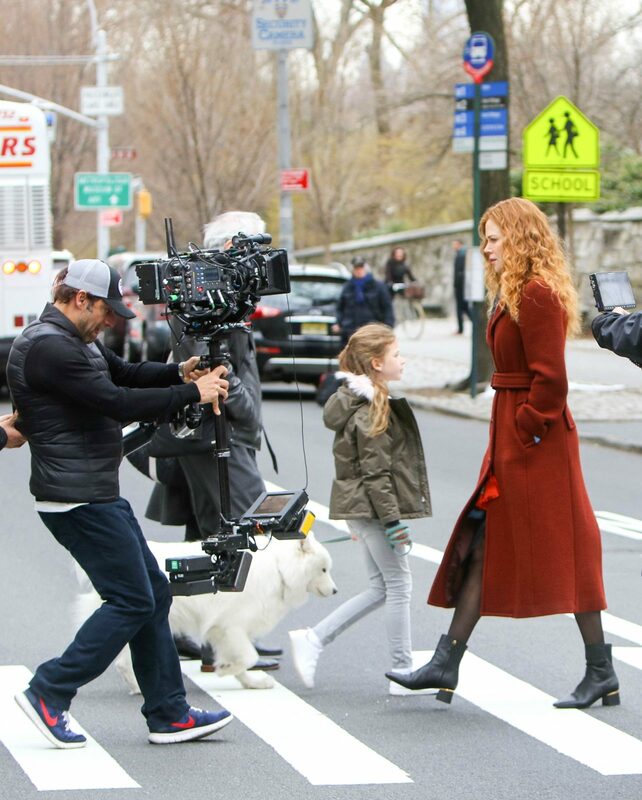 But it seems Nicole Kidman’s youngest daughter Faith, eight, is following in her famous mum’s footsteps as she happily joined her between scenes on set in New York recently – looking a complete natural around the filming team. Nicole is busy filming new HBO movie The Undoing and appeared to be involved in some intense moments as she stood in the street with a sombre expression on her face. Nicole Kidman’s daughter Faith mimicked her walk perfectly. Source: Getty. Wearing a long red coat and black ankle boots, she looked effortlessly stylish in character and showed off her new flowing and curly red locks for the role. At one point, the actress could be seen walking across the road as she looked into the camera, while her daughter crossed the other way holding on to a dog on the lead, as she played pet-sitter on set. Faith looked adorable in some light grey trousers and a khaki coat with a fur hood. It’s unclear at this stage whether she will be taking on a small role in the film alongside her mum. Nicole kept a protective hand on her daughter between takes. Source: Getty. Nicole’s natural hair is a return to her more classic style, having been known around the world for her beautiful red hair and curls in past movies. The iconic look was seen in movies such as Moulin Rouge, Eyes Wide Shut and Practical Magic, just to name a few. Of course, the star has opted for a blonde style in recent times. Her latest role in The Undoing sees her play a successful therapist on the brink of publishing her first book. The show is also set to star Fala Chen, Hugh Grant and Noah Jupe and is based on the novel You Should Have Known by Jean Hanff Korelitz. It will follow the journey of Grace as she sets out on a new path with her child following the disappearance of her husband. Are you a fan of Nicole Kidman? Did any of your children follow in your footsteps when it came to their career?